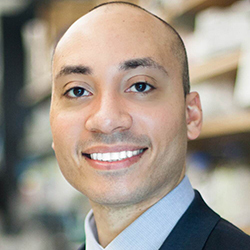 Northwestern Engineering’s Evan Scott, assistant professor of biomedical engineering, has received a New Innovator Award from the National Institutes of Health (NIH). The award supports exceptionally creative, early-career investigators who propose innovative, high-impact projects. The award, providing $1.5 million in direct funds over five years, will support Scott’s development of combination immunotherapies for heart disease. Scott is a member of the Simpson Querrey Institute for BioNanotechnology, Chemistry of Life Processes Institute, and the Interdepartmental Biological Sciences Program. His laboratory applies principles from biomaterials sciences, nanotechnology, and tissue engineering toward the development of translational immunotherapies for heart disease and the rational design of vaccines. Prior to joining Northwestern in 2013, Scott earned a bachelor’s degree from Brown University and PhD from Washington University in St. Louis. As a Whitaker International Scholar, he performed postdoctoral research at the Ecole Polytechnique Federale de Lausanne in Switzerland, where he focused on the development of new formulations and strategies for HIV vaccination and cancer immunotherapy. Scott has received numerous awards, including the 2014 American Heart Association Development Grant and 2015 National Science Foundation CAREER Award.